I hope you had a nice Memorial Day weekend. It is difficult to believe that, after our wonderful Spring Author's night, we have only two more weeks left of school! Read on for important information regarding the next nine days! Ha! This Wednesday: The Spring Concert! Just another reminder that our annual Spring Concert is this coming Wednesday, May 29, at 6:30pm. Grades 4th through 8th will be performing and musicians are asked to be here no later than 6pm in concert attire: white tops (no t-shirts) tucked in, black bottoms, and dress shoes. Parking will be in the back. If for some reason your child will not be able to make the performance please let me know so that we can plan accordingly. Our plan next school year is to, for the first time, begin a new "Upper Grades Strings Orchestra" program. This is an exciting development for us, and that is one reason why Michele and I have tried so hard to keep the children playing their dang violin throughout the school year--in spite of the changes in strings teachers. Students will have the opportunity to take one of two different classes: Strings Orchestra or Recorder Orchestra. Students whoi are interested in the strings orchestra will have to show their skill of playing their stringed instrument at a required level in order to participate. All students who do not choose to continue a stringed instrument will be placed in a Recorder class. The majority of the students in our 5th Grade class will easily make the upper grades orchestra I imagine, so summer-time practice will be hugely helpful. What, You Say? New/Different Stringed Instrument??? 3) Commit to pursuing private instruction in that instrument during the upcoming school year. If your child is indeed interested in doing this please speak to me as soon as possible so that we can begin to plan accordingly. To that end...Summer Camp for the Violin/Viola/Cello/Bass? Here is a great (and incredibly [!!!] affordable) way to keep the violin running over the summer: Summer Strings "camp". The deadline for the discount for our summer strings camp offered by Tammie Dyer, our violin teacher, is swiftly approaching. Payment and registration is due by Friday, May 31 to receive the 10% discount. Class size is limited to six-ten students with a cost of $12 per child/session. Sessions are one hour in length and will be offered in two time slots: 11m-12pm and 12:30pm – 1:30pm on five Wednesdays: June 26, July 3, July 24, and July 31. All fees must be paid in full to finalize registration and attend camp. Drop-ins will be available based on space, with payment due at time of drop-off. All sessions will be held at SBS in the library. Tammie Dyer is willing to work with beginning-level students interested in moving into another stringed instrument (viola, cello, and bass) as well over the summer. If this is something your child would like to do, please ask me about it this week. She is also available for private lessons during the summer months. The aim of our work in the coming few years is to nurture within the children the "Life Lessons" that we assembled together on the chalk board. We must help them to develop the "Non-Cognitive Behaviors/Skills" that we spoke of, and help the children build the "Capacities" of steadfastness, inner organization, purposefulness, imagination, will, sense of beauty, and objectivity in order to face the unknown challenges they encounter on their path through life. - a surrounding culture of "hyper concern"
By penetrating these challenges, staying focused on our goals, and supporting one another along the way, we collectively benefit from each other's perspectives and experiences. As one parent pointed out, most of these "challenges" conversely provide us with incredible opportunities as well, which makes things kind of complicated. Abundance is indeed a gift; It's important to remain vigilant and concerned for our childrens' safety; Technology offers such incredible gifts! So we are doubly challenged with remaining vigilant, and on guard, while at the same time feeling gratitude and benefitting from the gifts these advances bring to our lives. Consider and clarify your personal boundaries around the issues we discussed. Consider and clarify how you will (inevitably) face the different boundaries of others. Consider how you will support the whole of our class community in the coming school year. Over the coming weeks, I would appreciate hearing any thoughts you may have about these requests. To that end, as promised, I will be sending out a survey to gather your input, and I hope you will take the time to respond thoughtfully and honestly. As mentioned at our parent gathering, a reminder to consider helping your child to learn how to correctly keyboard (touch-type/type) this summer. I've encouraged the children to speak with you about it too! Next year, students who pass a "typing test" and prove that they are able to correctly and efficiently keyboard will be allowed to use that tool for their classwork (where appropriate), and so the summer is a great time to start learning. There are many different free options online, as well as a myriad of stand alone programs that can be purchased. As I told the students, practicing (correctly) ten-fifteen minutes each day all summer long will probably do the trick. Next year our Class Family will grow by one student. Zara Keen, Betsy Thagard and Andrew Keen's daughter, will join our class. This will allow Betsy to have her daughter attend the same school in which she teaches, and also possibly allow them to move to the Napa area! Zara is currently attending Summerfield Waldorf School, and through a few visits to our school with her mom, has already had a chance to get to know many of our students, which is just great. Zara even briefly appeared in Mia's personal narrative essay at our Author's Night last week! So, I am including Betsy and Andrew in our mail group starting now, and I hope that as Zara and Betsy move more deeply into our fold that you will have the opportunity to introduce yourselves. Zara will to be a wonderful edition to our class! Saturday, June 1st-- Birds and Bees Fundraiser. Wednesday, May 29-- Spring Concert-- Performers arrive at 6:00pm. Performance at 6:30pm. Week of June 3rd: Half Days! Pick-up time is 12:35 all week. Okay, that's it. Thank you for reading! May you have a great short week. This is my last week with the students until later in the Spring. Following the February Break, Michele will take the baton and run with it into the spring, heading towards the Greek Games in May. Then I return for the last part of the school year. The students have been working on writing these past two weeks, and we are wrapping up two different essays, one finished last week, one this week, and both due Friday, beautifully written into the main lesson books. FYI, there will almost certainly be homework this week, as the students finish their work, so feel free to check in with your child in order to make sure they are staying on top of their work. I ask this of you because quite a handful of students are struggling to turn in their work on time-- even with lots of support on my behalf-- and help will certainly come in handy. Thank you for considering my requests about technology and cell phones from last week's update. The day after I sent out my thoughts to you we heard from our daughter India, who as many of you know is studying in China as an exchange student and living with a Chinese family in Nanjing. She told us a story about her host family had had a heated (!) argument that past week with their own daughter about her access to the internet, and the amount of time she was spending on the computer. This is a reminder to me that the serious issues we are facing as parents around technology right now are world-wide, and I must admit that it was strangely relieving to hear this through the mouth of my own daughter, a 17-year old tech-using teen. I heard back from a whopping 13 of you about my requests, which is almost half, so clearly I touched a nerve. Thank you for being so thoughtful and considerate as we work together with your children! Our last Saturday meeting worked very well for Michele and I so we would like to try it again. Please mark your calendars right away so that you can lock in the time to attend this gathering. It would be so wonderful to have every family represented! We are moving the Author's night from the winter to the spring. Please mark your calendars accordingly for what is for sure to be a wonderful evening of creative words and thoughts! A reminder that this Wednesday is our encore performance for the Waldorf at Weill gathering. Call time: 6:00pm. It is important that everyone arrive on time. All students will gather at the performers' entrance. Students and any Adult Chaperones will head into the hall through this entrance, and Chaperones will be asked to stay with the children at all times. As you exit your cars and walk toward Weill Hall you will see someone holding a sign with our school’s name on it. Please gather with this person. He/she will stay with us through the entire performance as our guide. Once everyone has arrived, each performer and chaperone will be given a name tag. The name tags are for entrance and crowd control, not to be worn on stage, but necessary to access hall seating. Our guide will lead us into our specific “green room” through the performers’ entrance. Non-chaperone parents will make their way into the performance hall, which opens at 6:30pm. There will be ticket takers; ushers will hand out programs and direct you to your seat, and there is a coat check. There will be refreshments during intermission but no liquid or food of any kind is allowed in the performance hall. Remember, no photography will be allowed. As I explained last week, the show begins at 7:00pm. Our class is scheduled to perform during the second half of the show. The students have seats already arranged for them in the hall to watch the first half of the performance, so if you reserved a seat for your 5th Grader, please offer it to someone else who needs it as the performance is sold out. I think there are a few parents in the class who are still hoping to score some seats somehow. Thank you vert much (!) to those of you who have offered to serve as a helper/chaperone. I will communicate with you via a separate email. My dream still remains that every child will arrive for the performance in costume and, possibly even make-up-ready, so that all we have to do it touch things up. If you are not comfortable with Egyptian Eye make-up then we will take care of it when your child arrives. Embalmers should have their hair braided/gelled to their head so that we can put the bald-caps on right when we arrive at the Hall. It should be an exciting and fun evening. I would appreciate it if you would please try your very best to arrive on time so that we can make all this happen. If for some reason your child is unable to attend please, definitely, let me know. Remember. 6:00pm. After such intense effort and focus put towards a class play, the day after the final performance is often bittersweet. The bitter part arises obviously because, after all the preparation and excitement it is so very difficult to say goodbye to it all. Not surprisingly, many children were quite sad that it was all over. The sweet part comes from the tidal wave of euphoria and glee arising as a class accomplishes something so difficult together. It's a big thing, really! A class play, when successful, creates a kind of social Gorilla Glue, binding the group together into one single being; creating a sense of "we" and an appreciation for the "other" that is both profound and amazingly palpable. I wish you could have been in the room on Friday morning to hear the thoughts and feelings expressed by the students about how things went. With great sincerity, and humor, and sensitivity the children recognized and appreciated each other, and the hard work that they had mustered. It was extremely rewarding to witness, and it made all the long nights and stressful moments disappear into the ethers. I continue to be moved by the depth of the children's awareness of each others' successes and hard work, and the flexibility with which they deal with each other's gifts and eccentricities as well. What an incredible group of children. Huge, huge thank you's to every single one of you who went out of your way to help us out with this production in both large and small ways. From the SWAT team of pre-show mom/grandma make-up and costume helpers, to the builders/remodelers of the Multi-Use Room space, to the folks who helped with a costume-making, prop creation, and food preparation… your help was enormously, enormously appreciated! Thank you. If your child brought their costume home after the play I would appreciate it very much if you would help him or her to hang it on a hanger, or put it into a bag to keep it safe. We will need all the costumes for our encore performance at the Green Music Center later in February. Feel free to also send the costume back to class and I will hang it up here for safe keeping, if you would prefer. This week we begin a three week-long block focusing once again on writing and grammar. The students will be practicing all kinds of different things, including compare/contrast essays and personal narratives. We will also spend some quality time reviewing some (seemingly) forgotten spelling rules, as well as review the use of interjections, prepositions, and verb tense-- something they are also learning to do in Spanish. Last week the students should have finished their current books (either The Golden Goblet, or The Magnificent Mummy Maker. I am assigning them an at-home book response assignment related to these books to be completed by Monday, February 4. Of course, students can always turn it in earlier if they wish. 1) Identify any note on a musical staff immediately, without having to sit their and think about it. 2) Play the note on their instrument quickly right after I call it out: "A," or, "C!" Flashcards may be helpful. As they practice a piece of music they should be following along on the page of music as they play their instrument, note-by note, and not just play the piece by ear. The dream is that the more they follow the notes on the page while playing, and the more they associate each finger position on the instrument with the note on the page, their ability to site-read will improve in earnest. This is an important, and quite difficult step, for sure, but I know with practice and determination, these children can do it. There is little they cannot do, actually. Our trip is still on for Wednesday. It works our beautifully to take 6 vans, each with 5 child passengers and one passenger adult. Since we are only taking the 5+ seater vans, all other cars left behind will need to be parked in front of the kindergartens and NOT on the playground for the day. Regular drop off and pick-up times apply. As I am sure you all know, I unveiled our class play to the students last week. Upon our return from the Winter Break we will begin rehearing with gusto, but I wanted to make sure you got the date for the play on your calendar, so that there are no unfortunate conflicts. Please note that it is different from the date I sent out last week. Performance: Thursday, January 24, 6:30pm. Another Change: Class Meeting Date… Saturday? When: Saturday, January 12, 10:00am-12:00noon. I will bring the coffee. Maybe we can potluck for some edibles? As you may have heard, Pharaoh Albus Von Huckencluck died last week and so the Royal Embalmers began the 70 day process of preparing the great Pharaoh's body for his tomb. To that end we are in need of some very large zip lock bags-- larger than the gallon bags I currently have in the 5th Grade temple. If by chance you have some larger sized bags (1½ to 2 Gallon would be best, not bigger) sitting around your home I would love to take two or three off your hands. I am looking for a copy of our First Grade class picture. Jennifer and I cannot find our copy. If you have one you could loan me, I would like to copy it. I would return it to you quickly, I promise. Anyone? How did it go last week? Did your child practice every day? I noticed that fewer violins were left in the class at the end of the day on Monday and Friday, so hopefully that is sign that your child hopped to it on his or her own. Thank you so much for your help with this. One note (no pun intended) regarding practice this week: For the Winter Festival the 5th Graders will be playing a few pieces of music for you. One of the tunes is (hopefully) a new one (Jolly Old St. Nicholas), given to them on Friday by Mrs. Ewing. It is not a hard piece of music (in my opinion), and they were asked to begin working on it over the weekend at least once in order to make better sense of it. So, with that, the pieces practiced each night should include: Perpetual Motion (both parts), Joy to the World (both parts), Jolly Old Saint Nicholas. Thank you to those of you who sent something in last week for the Food Drive. It was fun to watch our bag grow so full all week long and then be able to drop food into the barrel, now located in the office. I hope each student can bring in something to contribute to this worthwhile endeavor. Thank you as well to all of you who helped unleash the incredible flood of coins that made their way to class over the course of the week. By Friday our collection had increased by a factor of ten, requiring a second large container, and it took two students to carry the treasure over to the 3rd Grade classroom. It was a very fun thing to do, collecting all those coins, and I know Alena Nelson will be grateful for our efforts. Thank you. Half Day/Winter Festival: Friday, December 14. That's it. Have a wonderful last week before the break! On Friday we began a trial period with a potential new Strings Teacher, and it looks like she is going to be a keeper! Her name in Mrs. Ewing, and she comes to us with an enormous amount of experience (!!! ), actually, which is something quite new for our school. Because Michele and I have kept the children playing their violins, the class was a natural starting point for Mrs. Ewing, and so she will begin with Fifth Grade only for the remainder of this month, and then if all goes as planned, begin working with the other classes in January, after the break. Our violin class will be on Monday and Friday. Michele and I are extremely pleased with this development as it now time for us to remove violin practice from our daily main lesson period, where we have (with a bit of sacrifice) been keeping it since last year. Mrs. Ewing was pleasantly surprised that the the Fifth Graders could play so well, considering two non-violinists like us were in charge, and I can assure you that 95% of the reason why they were so impressive is because everyone practices almost every day in class. It's that simple. It is not that the are better at Violin than other classes. It is not that they are advanced, or special, or gifted. It is not that Michele or I are better teachers than others. The children play well because we made it a priority to practice every day, AND we asked them to practice at home too. This is now going to change, and children are going to have to practice on their own now at home, and NOT in class. This is HUGE moment for the children, and also for the class as a whole. Because, here is the reality of the situation: If your child does not practice at home on their own every day/evening, then she/he will not progress with the class. As your child falls behind she/he will begin to drag the whole class down with them. A child that does not know what she/he is doing generally becomes more disruptive too, and requires extra time from the teacher, which slows everything down even more! I have seen this happen time and time again. Really. It's a complete and absolute bummer, honestly, when this happens, and even more of a bummer when I have to start attending violin classes myself and act as the "enforcer" so that the rest of the class can benefit from the daily instruction. Having paid for private music lessons for my own children and knowing the cost and sacrifices associated with it, I scratch my head as well when I see families not taking full advantage of this amazing "free" opportunity for their child, and not helping to make sure their child participates with high effort. So, what I am getting at is that I am asking that you take this opportunity to recommit yourselves to support your children with violin this year. If a child comes home without a violin and cannot practice, I ask that you intervene. For the record, I have asked the children to practice every school day, and at least one day on the weekend. At the end of the school day we review exactly what to practice, so there should be no confusion. You should hear your child practicing multiple pieces a night, usually two pieces that are being mastered, and one that is under development, 15-20 minutes of focused practice total. If the violin needs to be tuned and you need assistance, I am more than happy to help. Have your child bring it in and I will do what I can. I have become a very excellent tuner, and will try to show your child how to work on it themselves too. As you can tell , I am passionate about all this. I have put forth significant energy towards giving the children an excellent start with this very difficult instrument-- to get them to this exact moment. The days of Mr. M (and Miss C) being the violin teacher must now come to an end. With your continued help and support I think the children will do amazing things during the second half of this year, and I am excited to watch them blossom. Please do not hesitate to talk to me about any and all of this if you have questions. Our trip to Egypt, San Jose style, is still on for Wednesday the 12th. As usual, we have lots and lots of adults who would like to come along. I have contacted the Museum and they have told me we have a maximum size of 44 individuals for our scheduled tour, which means we should be able to accommodate everybody currently listed on the sign-up page. I have already paid the entrance fee for the students, so each adult will need to pony up 15 dollars at the door when we arrive. I would prefer to do it that way rather than have to collect money from each of you ahead of time, if you wouldn't mind. As of Friday there were still some parents on the list who have not been cleared by the office to drive. I will wait until next weekend to arrange the cars so that you have time to do what you need to do. I plan to maximize the use of the larger cars in order to take as few cars as possible. We may end up with a couple of adult-only cars if need be, which I doubt will be a problem. We will be collecting food (non-perishables) during the last week of school before the break (week of December 5th) for the Napa Food Bank. I hope each student can bring in something to contribute. Feel free to send something in this week as well and we will make sure it gets to the right place. This coming Friday is the last day we will be collecting small change for our alumni, Elena Nelson's, project with the Noyaa School in Accra, Ghana. I have pulled my own bowl of pennies and miscellaneous change out of my top drawer this weekend in order to pour into our class collection tomorrow. If you too have pennies sliding around in your top drawer, please consider sending them our way on Monday, with your child and we will in turn slide them towards Elena's project in Africa. Okay, I think that's all. Have a great week! As Michele steps back and takes some time to relax and smell the flowers, I want to thank her so, so much for doing such a wonderful job with the students over these past many weeks. After visiting with the many children and parents in our conferences and hearing their enthusiastic thoughts about the past eight weeks, it was clear that Michele did a wonderful job! It was certainly not an easy undertaking, stepping into some well worn shoes. Learning about the students and their needs, and also the needs of the families, all in such a short period of time, was hugely challenging, but boy did she make it look easy. I am so happy to be working with her as a partner this year. Schedule Change: Winter Concert and Parent Meeting right next to each other!!!! I just discovered that the parent meeting and the Winter Concert are in the same week-- two nights in a row! Crud. I am so sorry that I made that mistake! The Winter Concert was just not on my radar. It is a super ginormous pet peeve of mine when families are asked to attend so many events in a week like this, so NO WAY! I would still really, like to get together for a parent gathering, however, so let's reschedule for Thursday, January 10th, from 6:30-8:30. I promise I will try hard to make the gathering informative and inspired! So mark/change your calendars accordingly. 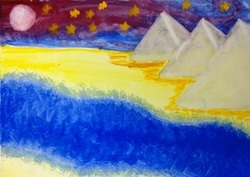 We begin a second Ancient Civilizations block with a dive into the amazing and mysterious world of Ancient Egypt. During this block of study I will also introduce the children to our class play, our longest (and hopefully most entertaining and fun to perform) production yet. We will also dive back into Writers Workshop again, and I will be working with the children further in following a writing process, which includes drafting, revision, editing, and general stylistic techniques for expressing their very amazing thoughts in clear and effective ways. In math we will continue further into the world of decimals, including multiplication and division of decimals. I will be working with the children on the extremely important technique of estimating numbers as well, and we will begin larger division with double digit divisors (6844÷55). Okay, I think that's all. I look forward to seeing everybody again! This week we conclude our adventures in Ancient Civilization by delving into Mesopotamia, land of the world's earliest civilizations. What is a civilization? How is it formed? What made this area of the "Fertile Crescent" so special? What are some of their inventions that still effect our world today? We will also learn about one of the oldest written stories on earth - The Epic of Gilgamesh! In math we continue our fraction work with adding and subtracting fractions with unlike denominators. This includes using least common multiples to create equivalent fractions, and greatest common factors to simplifying answers. We will also practice regrouping during the subtraction lessons. In language arts, students are putting their final touches on their Angelo Coast Reserve and summer adventure papers. We are also having excellent discussions on our reader, The Iron Ring. Incidences and characters seem to be interwoven through the story so far. What will happen next as Tamar struggles in the midst of a war between an honorable, deposed king and his deplorable cousin the odious, reigning tyrant? Will Tamar ever make it to Ranapura to meet a king that he may have imagined to settle a debt that may be an illusion? Math class yesterday was one of those times where the path of the class differed from my plan. I thought to simple review previous fraction concepts then move on, but I was lead to ask, "If the denominator of a fraction is 1, then why does it simplify to the numerator as a whole number?". Various students gave excellent answers as to the process of answering the problem, but I was searching for a concept or what the number in the denominator actually meant. The perplexed students were VERY enthusiastic about finding the answer to my question. After some creative replies, one student remembered that the denominator was the number of pieces that an object was divided into and that 1 as a denominator meant the whole object, so the numerator was the number of whole objects. Faces lit up with recognition and understanding. While many of the students could have easily used a process to simplify a problem like "75/1", now there was more attention paid to the meaning behind the denominator. Today's planned lesson had to put off, but it was well worth the experience! This week, we finish up our time in ancient Persia and the story of Zarathustra and move on to Mesopotamia and the epic of Gilgamesh. This main lesson block will extend into next week. October 24 the students will be going on the first of two field trips with the group Acorns to Oaks to collect/plant acorns and to learn about oak ecology as an extension of their botany main lesson block. No need to worry about carpooling or chaperones! All of this has been taken care of. We will be taking a real school bus for the first time (note - don't tell the kids, we want to surprise them!) Permission slips will be coming soon. This Thursday auditions for the 5th-8th grade talent show will be held from 2 - 3 pm in the multi-use room. The numerous 5th graders who have signed up need to be prepared to show their acts. Remember to check you student's binder daily for homework. It is their responsibility to write it down before the end of the day is done. A big, hearty thank you to all who worked so hard on "The Knight's Quest" and EVF itself. The 5th grade booth was INCREDIBLE and, it seemed, quite popular!!! Last week the students heard the story of another hero who was quite the opposite of Rama the warrior - the story of Siddhartha who later became the Buddha. Where Rama was an epic champion who bravely conquered demon rakshasas to save others, Siddhartha was a contemplative who wanted the answer to relieving suffering in the world. As the students discuss Buddhism's Four Noble Truths and Eightfold Path this week, I look forward to hearing their fascinating thoughts on these concepts. Then it's off to ancient Persia! Math - fraction work is continuing with Greatest Common Multiples (used to reduce fractions to their simplest) and Least Common Denominators (for later use when we are adding fractions with unlike denominators). Violin - We are daily practicing both parts of "Perpetual Motion" along with learning both parts of "Joy to the World". Choir - We are working on a round and a two-part song with the 4th grade. Wednesday Ben Johns will be with the students doing a singing workshop during 3rd period so there will be no math that day. Thank you all for supporting your children by checking and editing their papers, ensuring that they finish their homework, and having them practice violin and recorder each day. Last week began our Ancient Civilizations main lesson block. The students were fascinated by the Hindu tales of gods and heros, dragons and rakshasas (demons). Perhaps they have recounted to you the heroics of Rama as he, his devoted brother Lashman and the valiant monkey Hanuman, saved Rama's beloved wife Sita from Ravana the wicked ten-headed, twenty-armed king of the rakshasas. Along the way, we have had enlightening discussions on the Hindu concepts of reincarnation, the caste system, dharma, and karma and discovered why the Ganges River is considered to be sacred. The students drawings of the god Brahma are excellent (the artistic level of this class is quite high) and their various writings have been quite interesting to read. In math we continued our fraction work with finding the greatest common factors to aid in reducing fractions to their simplest form. From here on, all fraction answers must be in their lowest terms (at least until high school when they will leave answers in the improper form for higher math). This week we will be estimating fractions (closer to 0, 1/2, or 1) and working with least common multiples to find the least common denominator between two fractions. This week we will also be starting a new book, The Iron Ring by Lloyd Alexander. This book evokes the atmosphere and themes of Ancient India and belies the authors fascination for the epic works of India (i.e. The Ramayana and The Mahabharata). It is an enchanting story that would make an excellent "family read" for topics of discussion. Hear Ye, Hear Ye! EVF is 12 days away and Knight's Quest is our 5th Grade challenge this year! Plans are underway for a fabulous obstacle course, but we need your help. You can leave these items in front of the classroom by Wed Oct 10 but the sooner the better so we know what we have would really help us out. Because of the nature of this booth we need a lot of help to set-up on Friday afternoon and Sat morning, and run and breakdown the booth during the day so that it will be fun and safe for the kids. Please sign-up for one or more shifts on this google Doc https://docs.google.com/spreadsheet/ccc?key=0AoBiFwvvBypOdFRzMUV0MzFoVUdDdG9Cc0JtYjJMT3c&pli=1#gid=0. There are also opportunities for the kids to help run the booth, their sign up sheet will be post outside the classroom this week. You will be contacted to confirm their time and task. Thank you all, and have a wonderful week!